In this book, Kathleen Tyner examines the tenets of literacy through a historical lens to demonstrate how new communication technologies are resisted and accepted over time. 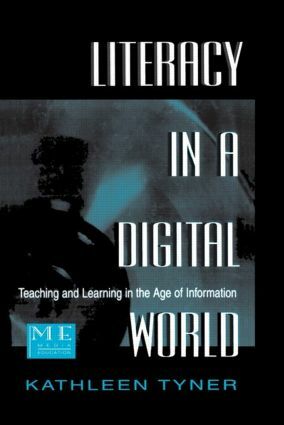 New uses of information for teaching and learning create a "disconnect" in the complex relationship between literacy and schooling, and raise questions about the purposes of literacy in a global, networked, educational environment. The way that new communication technologies change the nature of literacy in contemporary society is discussed as a rationale for corresponding changes in schooling. Digital technologies push beyond alphabetic literacy to explore the way that sound, image, and text can be incorporated into education. Attempts to redefine literacy terms--computer, information, technology, visual, and media literacies--proliferate and reflect the need to rethink entrenched assumptions about literacy. These multiple literacies are advanced to help users make sense of the information glut by fostering the ability to access, analyze, and produce communication in a variety of forms. Tyner explores the juncture between two broad movements that hope to improve education: educational technology and media education. A comparative analysis of these two movements develops a vision of teaching and learning that is critical, hands on, inquiry-based, and suitable for life in a mobile, global, participatory democracy. "This volume will interest media educators and researchers, information specialists, teacher educators, and students seeking an introduction to the field and examples of how new technologies and literacy practices can be integrated into the elementary, secondary, and postsecondary curriculum. Upper-division undergraduates and above." "Flipping back through the pages of Kathleen Tyner's new book, Literacy In a Digital World: Teaching and Learning in the Age of Information, I am amazed at how many of the pages are filled with my underlining, marginal notes and stars marking significant paragraphs. Reading it was like engaging in a rich and fluent conversation with one of the U.S. media literacy movement's finest thinkers. I learned a lot from the hours I spent in her literary spell." "This is really an important and wonderful book, which I urge everyone interested in media education to buy. I know that it made me turn off the phone, turn off the television and settle down to read it through carefully." "This book deserves to be read and I hope that it will be. It explores and attends to issues that need to be considered and it certainly fulfills a unique niche in our professional conversations." "Tyner's contribution to the development of media education in curricula and classrooms establishes a new paradigm for schoolteachers and international media education programmes: digital communication empowers students to go beyond the four walls of the classroom in order to have access to a broad set of different alternatives and educational perspectives….The empirical research, references and, particularly, the Web site information provide useful pointers for further research on the topic." "…I am amazed at how many of the pages are filled with my underlining, marginal notes and stars marking significant paragraphs. Reading it was like engaging in a rich and fluent conversation with one of the U.S. media literacy movement's finest thinkers. I learned a lot from the hours I spent in her literary spell." "As a writer, workshop leader and founder of Strategies for Media Literacy in San Francisco, Kathleen Tyner has made an invaluable contribution to the development of media literacy in the United States. A true pioneer, both practical and innovative, she has always been aware of new trends and has been one of the few Americans to consistently show up at international conferences where she is prepared to participate in debates about the direction of the movement….At a time when education is under siege and digital technologies are being uncritically accepted by schools, anxious to not be left behind, Literacy in a Digital World reveals many invaluable insights for effective technological understanding and survival. Tyner's practical knowledge of the field…have combined nicely with her important new research in this complex domain." Contents: Acknowledgments. Introduction. Pause on Literacy Fast Forward. Expanding Literacy. Divergence and Convergence on the Electronic Frontier. Splintering Literacies. Beyond Access. Representing Literacy in the Age of Information. Treading Water: Media Education in the United States. Moving Toward an Acquisition Model of Media Education. Representing Diversity--Media Analysis in Practice. Toward an Interactive Education. Afterword: A Tale of Two Cities. Appendix: Global Multiliteracy Networks.